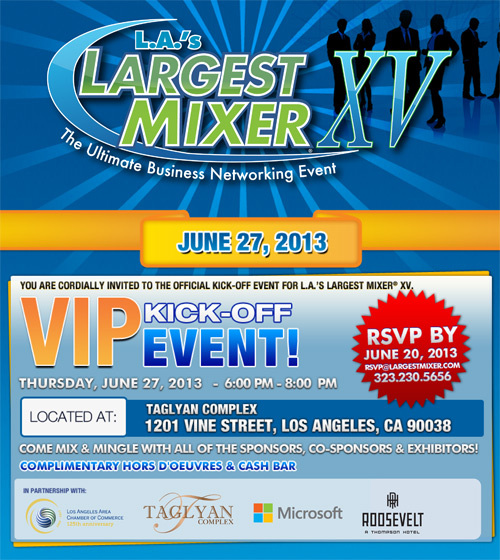 LA’s Largest Mixer celebrates its 15th annual event with a VIP Kick-Off Party at Taglyan Complex on June 27, from 6:00-8:00pm! The Ultimate Business Networking Event, as it is known, allows guests to mix and mingle with sponsors, co-sponsors, and exhibitors while enjoying complimentary hors d’oeuvres and cash bar. 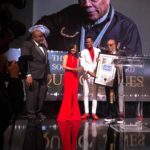 The actual event takes place at the Shrine Auditorium on July 18th, where hundreds of businesses set up booths to sample their products, meet new clients, and increase exposure. LA’s Largest Mixer XV is sure to be a huge gathering of companies. Past attendees have raved about the event and how beneficial the publicity has been to boosting sales. The kick-off at Taglyan allows even more exposure for companies, giving them the opportunity to exchange business cards and contact information before the big event. If you’re interested in attending, simply RSVP by June 20 by sending an email to RSVP@LARGESTMIXER.COM or calling 323-230-5656. Sponsors of the VIP Kick-Off include Los Angeles Area Chamber of Commerce, Taglyan Complex, Microsoft, and the Roosevelt Hotel.